Your's is as snug an office as any; particularly when the regiment is upon foreign service; but if you have given security, or have a commission to answer for your miscarriages, you must take care to go on fair and softly. Make your accounts as intricate as you can, and, if possible, unintelligible to every one but yourself; lest, in case you should be taken prisoner, your papers might give information to the enemy. Always grumble and make difficulties when officers go to you for money that is due to them; when you are obliged to pay them endeavour to make it appear granting them a favour, and tell them they are lucky dogs to get it. I dare say they would be of the same way of thinking if you had it in your power to withhold it. Be careful to keep up a right understanding with the agent; and be mindful of the old saying, When ... fall outetc. Always grumble and make difficulties when officers go to you for money that is due to them; when you are obliged to pay them endeavour to make it appear granting them a favour, and tell them they are lucky dogs to get it. You must also keep upon good terms with the commanding officer; which will be no difficult matter if he is extravagant and needy. Just before muster-day, get leave, or take it, to be absent from the regiment, and pretend that it is upon the business of your office, as to receive money, get cash for bills, settle with the agent, etc. The longer you stay away the better, and the more to your credit: for showing people that they cannot do without you will give them a high idea of your importance, and you will be sure of a hearty welcome on your return. Always close your accounts with errors excepted; and, as you give people this caution, it is but fair that the mistakes should be all in your own favour. I know not whence they call your monthly payrolls abstracts; unless it be considering them as abstracted from all sound arithmetic, and just calculation. 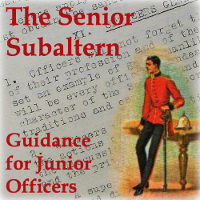 When you pay any allowance to the officers and soldiers beyond the usual subsistence, be sure to deduct six-pence in the pound for your friend the agent; who certainly deserves that perquisite for his great trouble and risk in taking care of the money for you so long: especially, as you may swear he has not put it out to interest.